The Travels Of Sir John Mandeville' presents itself as an account of China, India, and the Holy Land, written by an Englishman, Sir John Mandeville of St. Albans--who is in fact entirely fictitious. The identity of the true author is not known, but he was probably a mid-14th-century French cleric. The text was available in various versions and various languages, including Latin, French, and Middle English. The dialect of the present manuscript suggests that it was written in East Anglia, perhaps Norfolk. 'Sir John Mandeville' spends parts of his narrative describing the wondrous races and creatures that inhabit the edges of the known world. 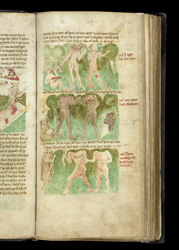 The caption in red in the right-hand margin identify (i) men that have but one eye, (ii) men that have eyes in their shoulders, and (iii) men that have mouths behind their shoulders.